JBL Arena 170 review | What Hi-Fi? The smallest floorstander in JBL’s entry-level series, the Arena 170 loudspeakers are our first taste of the range and, at just £400, they are excellent value. 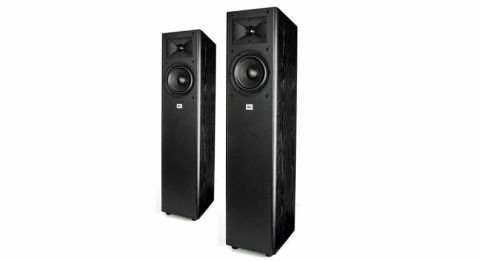 Until recently, JBL’s most affordable floorstanders populated midrange territory in the Studio or ES Series. Not any more. Having introduced its new budget speaker range Arena – made up of two floorstander models, two pairs of standmounters, a centre speaker and a subwoofer – JBL now has a complete 5.1 speaker package available for less than £1000. If you’re after floorstanders for a small to medium-sized room, these should be high on your wish list: they’re compact, perform best close to a wall (they’re rear-ported) and won’t overpower a small space. Those with larger rooms certainly shouldn’t be put off, but the JBLs simply won’t generate the same powerful, room-shaking sound of the Wharfedale Diamond 230s for example. That lack of great room-shaking ability is partly down to the JBL Arena 170s’ bass performance: what’s there is fairly detailed and agile, but the fact it lacks power and punch makes the presentation feel just a little lacking in heft. Big crescendos aren’t as imposing or as impressive as they should be. Yet we find ourselves taken with the Arena 170s’ sound. Equal parts crisp and clean, supple and lively, the JBLs breeze through our diverse playlist (from Van Morrison’s bluesy rock to Eminem’s edgy raps) with decent precision and timing. There’s a sense of fun and immediacy to the galloping rhythms in The Smith’s Frankly, Mr. Shankly the delivery fast and forward, but not in-your-face. Morrissey’s vocals are clear and candid thanks to a convincing midrange. Up top, treble could do with more refinement – the song’s ever-present cymbals are perhaps a little too cutting and intense. Despite not being big and bold, the soundstage is relatively spacious, and never overcrowded when the chorus’s dense synthesized strings come into play. You’ll get the best results (and more solidity) by positioning them close to a back wall and screwing the supplied spikes into the rubber feet. System matching is key – an agile, rhythmically adept amp such as the Marantz PM6005 (£300) will make the perfect ally. We’d avoid overly lean or bright-sounding kit. We rather like the JBL Arena 170s’ quirky, contemporary design, where only the side panels are dressed in a wood veneer. The baffle and interestingly sloped top panel are finished in a grainy-effect plastic instead; it’s possibly a cost-cutting measure, but looks smart enough. With the top-half grille attached, the façade is clean and unspoiled. Remove it and the drivers look a little as if they’ve been targets at a shooting range, the smattering of screws around them anything but discreet. Exposing it allows you to see the 25mm soft-dome tweeter’s unusual waveguide design, which borrows from the company’s high-ranging ‘professional’ models. According to JBL, this is for wider dispersion and more detail in the higher frequencies (though the latter is questionable). Below it is a more typical 18cm fibre composite driver. The JBL Arena 170 floorstanders might not quite have what it takes to trouble the more versatile sub-£500 class leaders, but they are fun, entertaining speakers. And if these are anything to go by, we can’t wait to see what the rest of the range has to offer on hi-fi and home cinema turf. Watch this space!